“In many cases,” according to the Court majority, “a representative sample is ‘the only practicable means to collect and present relevant data’” to prove that the company or entity being sued was legally at fault. The opinion went on to provide some guidance to when such evidence would be allowed into a class action case: that is, when each member of the class could rely on the sample to establish that he would have won the case, if he had filed it individually, rather than along with others. 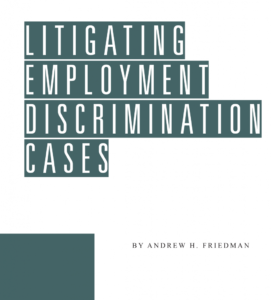 Andrew H. Friedman literally wrote “the book” on employment discrimination law. Mostafa quassani on Wage and Hour Class Action Lawsuit Filed Against Tatitlek Support Services, Inc.
Farid Barek on Wage and Hour Class Action Lawsuit Filed Against Tatitlek Support Services, Inc.